Be nice to your cauliflower. Hug it, kiss it, don't murder it by boiling it to death! A quick session in the frying pan with some super tasty spicy sauce. Now that is showing the love. Chop the cauliflower into large florets and lightly steam. Heat the oil in a large frying pan and pan fry the cauliflower until browned. Roast the capsicum until very soft then cool slightly. Remove skin and seeds. Heat the oil in a frying pan, add the garlic and lightly cook without colour. Blend the garlic and oil with the capsicum and season with salt and pepper. 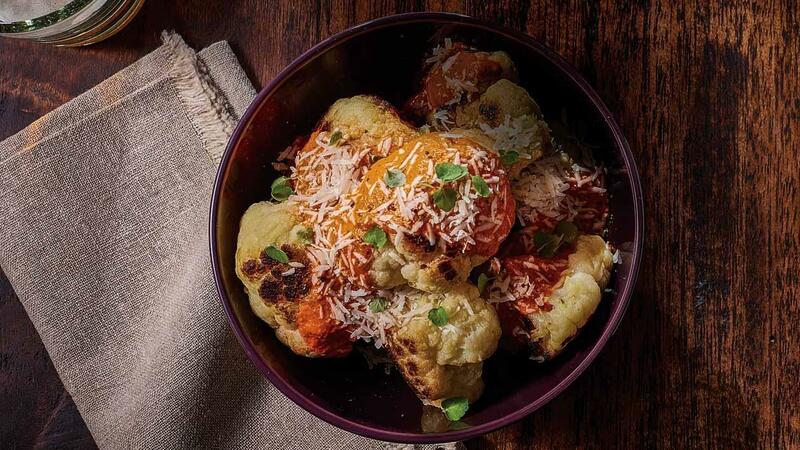 Pour the sauce over the cauliflower and sprinkle with parmesan. Garnish with micro herbs if desired and serve.